When you are trying to conceive, it is vital to maintain a proper hormonal balance, with an ideal dietary intake. YouthBerry’s Fertility Aid is a natural blend that helps enhance fertility health. It helps to support and maintain a hormone balance. This powerful natural blend is available for men and women. The reproductive process in women (i.e. the production of an egg cell) involves a great deal of oxidative energy which in turn generates high levels of reactive oxygen species, which is linked to excessive excreting beneficial nutrients. To combat the potentially harmful effects of the reactive oxygen species, the bodies of women use a number of antioxidant defense systems. 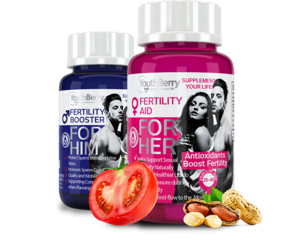 YouthBerry’s Fertility Aid for Her has Astaxanthin, L-arginine, Vitamin B12 with Selenium, Zinc and Iron complex that will support your natural defense mechanism, promote blood flow to the most intimate areas. Fertility Aid for Her: The reproductive process in women (i.e. the production of an egg cell) involves a great deal of oxidative energy which in turn generates high levels of reactive oxygen species, which is linked to excessive excreting beneficial nutrients. To combat the potentially harmful effects of the reactive oxygen species, the bodies of women use a number of antioxidant defense systems. 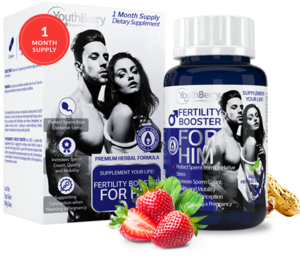 YouthBerry’s Fertility Aid for Her has Astaxanthin, L-arginine, Vitamin B12 with Selenium, Zinc and Iron complex that will support your natural defense mechanism, promote blood flow to the most intimate areas.Fertility Booster for Him: YouthBerry’s Fertility Booster has CoQ10 is a vitamin-like supplement that is suggested toenhance both male and female fertility. Found in every cell of the body, CoQ10 is a part of theelectron transport chain which is responsible for generating energy in our cells. Functioning asan antioxidant, it decreases the damaging effects of free radicals on the reproductive system.It is believed that as we age, our naturally occurring levels of CoQ10 diminish. As a result, theprocesses that require high energy, such as those associated with fertilization and embryodevelopment, are unable to work as hard – resulting in a lower efficiency, Fertility Booster isformulated to help you with just that!